Peutz-Jeghers syndrome is a rare, inherited benign intestinal polyposis syndrome that has historically required multiple laparotomies throughout the patient’s lifetime. Frequent endoscopic screening and resection of the hamartomatous polyps reduces the risk of local complications such as intestinal obstruction or intussusception. In certain situations, an endoscopic polypectomy may not be technically possible and a combined laparoscopic and intraoperative enteroscopic approach is advocated. 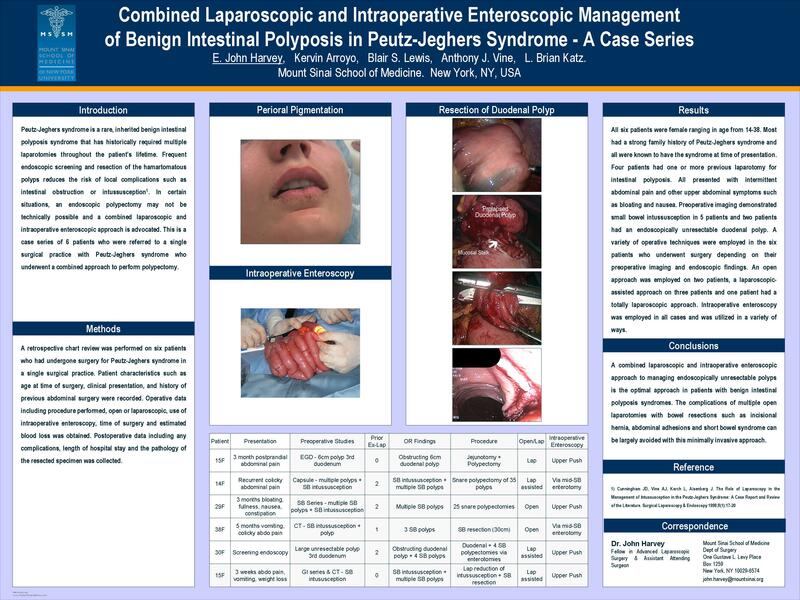 This is a case series of 6 patients who were referred to a single surgical practice with Peutz-Jeghers syndrome who underwent a combined approach to perform polypectomy. A retrospective chart review was performed on six patients who had undergone surgery for Peutz-Jeghers syndrome in a single surgical practice. Patient characteristics such as age at time of surgery, clinical presentation, and history of previous abdominal surgery were recorded. Operative data including procedure performed, open or laparoscopic, use of intraoperative enteroscopy, time of surgery and estimated blood loss was obtained. Postoperative data including any complications, hospital stay and the pathology of the resected specimen was collected. All six patients were female ranging in age from 14-38. Most had a strong family history of Peutz-Jeghers syndrome and all were known to have the syndrome at time of presentation. Four patients had one or more previous laparotomy for intestinal polyposis. All presented with intermittent abdominal pain and other upper abdominal symptoms such as bloating and nausea. Preoperative imaging demonstrated small bowel intussusception in 5 patients and two patients had an endoscopically unresectable duodenal polyp. A variety of operative techniques were employed in the six patients who underwent surgery depending on their preoperative imaging and endoscopic findings. An open approach was employed on two patients, a laparoscopic-assisted approach on three patients and one patient had a totally laparoscopic approach. Intraoperative enteroscopy was employed in all cases and was utilized in a variety of ways. A combined laparoscopic and intraoperative enteroscopic approach to managing endoscopically unresectable polyps is the optimal approach in patients with benign intestinal polyposis syndromes. The complications of multiple open laparotomies with bowel resections such as incisional hernia, abdominal adhesions and short bowel syndrome can be largely avoided with this minimally invasive approach.